You know those really nice, tailored sweatpants that you can wear at the grocery store, at the gym, on an airplane, or even in the office (depending on your workplace, of course)? Cole Haan created the shoe version of that. The new ZERØGRAND All-Day Trainers With Stitchlite (available for men and women) combine the lightweight construction of Cole Haan’s ultra-successful ZERØGRAND shoes with the breathable, attractive Stitchlite knit that we’ve come to love, and add in a tongue-free design and extra heel padding to create one of the most comfortable and lightweight sneakers I’ve ever worn. Available in a variety of designs, and with rubber-like reinforcements that can be either understated or eye catching depending on the colorway, these can present either as workout shoes or all-purpose sneakers. The black and the marine blue colorways in particular wouldn’t turn any heads in a casual office environment, but the lightweight sole and slight elasticity of the upper fabric mean they feel like slippers, even if they look like smart-casual sneakers. 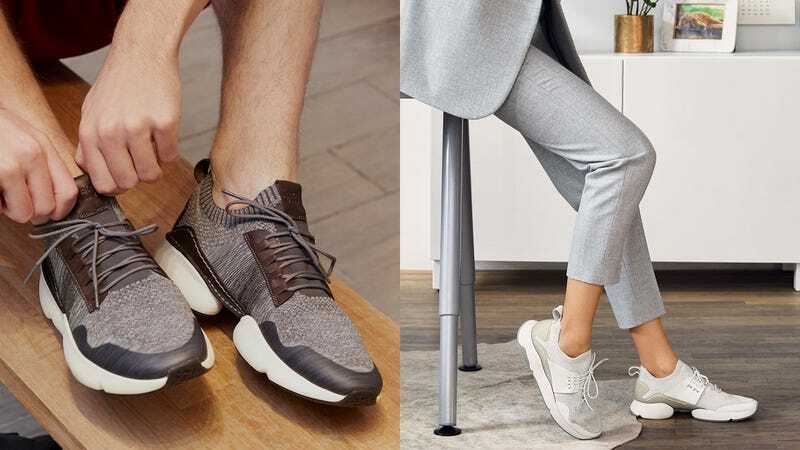 Cole Haan is marketing these as shoes that you can wear to the office, around town, or to the gym — though I’m a bit dubious about the latter. Personally, I prefer the shoes I exercise in to be lashed tight to my foot, and the stretchiness of the All Day Trainers’ Stitchlite upper means they never felt quite as supportive as I’d like for any serious working out. Going for a walk with the dog? I’ll slip these on in a heartbeat. Going for a run or playing sports? I’ll probably stick to purpose-built athletic shoes. That said, I have fairly narrow feet, and the tongue-free construction of these shoes means I can’t tighten them over the top of my foot as much as I can my other shoes. But if you have wider feet, they may feel perfect. So...work, casual wear, fitness. I’ll give Cole Haan credit for 2.5 out of three, though I work for a media company, not like, a bank, so your mileage may vary in the office. At the very least, they’ve created a great looking sneaker that’s incredibly comfortable to wear, and stupid-easy to put on and take off.